I never thought much about collecting photography until I started working at photo-eye Gallery. In the last few months, I have been going through our flat files, getting familiar with the work of the many great artists we represent. Over the next several weeks, I will be posting a selection of work from photo-eye Gallery artists that I find inspiring, beautiful and best of all, affordable for both first-time and avid collectors. For this installment, I will focus on selected prints from David H. Gibson, Jo Whaley and Maria Luisa Morando. I found myself drawn to David H. Gibson’s Patterns in the Land series. 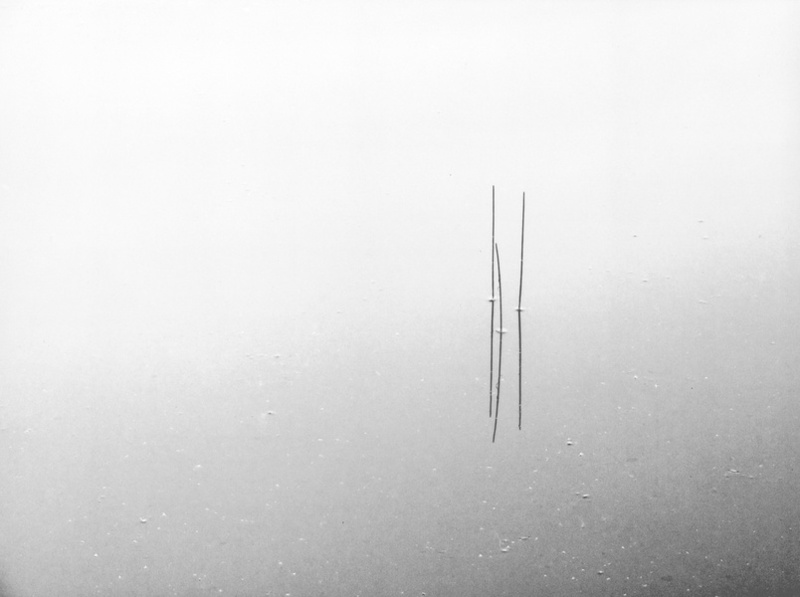 These abstract minimalist photographs are utterly fascinating. When I saw them in person for the first time, I thought I was looking at a hand drawing of geometric shapes. Sometimes, the lines are so perfect they look like they could be computer renderings. Gibson is an authentic photographer who still uses a traditional darkroom set-up to produce these stunning silver-gelatin photographs. Nothing is hand-drawn here, unless you consider his careful, perfectly framed compositions. 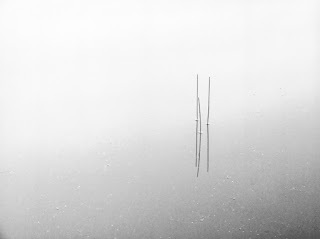 What we see in these photographs are lotus stems and reeds coming up from a reflective body of water. The detailed stillness that he captures in these photographs, and throughout his prolific body of work, is quite awe-inspiring; I could get lost in them forever. Gibson often returns to the places he has photographed in the past. He writes, "The lotus pond [pictured above left] is another place of many returns. The early morning in the quiet at the beginning of the day is a meditation. The lotus pond was profoundly changed after hurricane Ike. The areas of open water are almost all gone and the lotus pond barely remains. The trees were killed by the salt and the water birds have found other places of open water. The photographs are a reminder of another time. Changes continue and I keep looking. "More work from David H. Gibson can be found here. 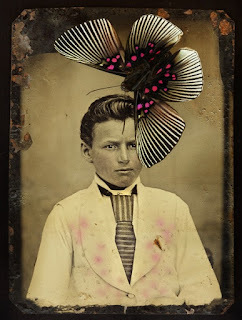 Harmonizing disparate elements with her keen eye, Whaley creatively compares a butterfly’s wings to a young boy’s tie. The looming butterfly, if any other creature, may seem ominous flying into the frame and over the fearful-looking boy – but these beautiful insects, known for their transformational quality (from caterpillar to butterfly) bring a sense of hope to the child. 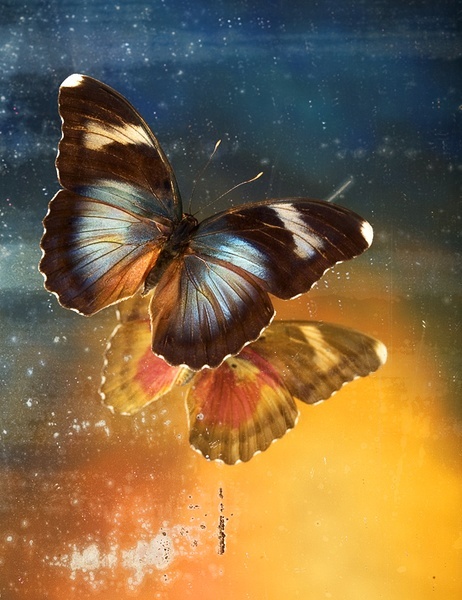 The visual comparison between the two creates an underlying narrative about how humans adorn themselves similarly to the butterfly in order to blend in with society. In Nymphalidae Hypolimnas, Whaley plays with light and darkness, the reflection and the reflected. To me, this photograph speaks to something deeper than the inherent beauty of these insects. I think about the deep waters of our own psyche where these dichotomies play out – in a theater, if you will. In some of her later work, she harnessed a more clinical, scientific approach. Whaley began using illustrations from old science books in lieu of found photographs, again alluding to the connections between nature, urban technology and psychology. In her series Theater of Insects and Natura Morta, she explores different themes with a unified aesthetic. Theater of Insects explores the relationship between beauty and nature, while Natura Morta strikes me as a bit darker in concept, though still quite beautiful, focusing on man-made elements and the dissonance between human intervention and the natural world. Photographs from Whaley's Natura Morta and Theater of Insects series are available through photo-eye Gallery. You can find images here. Maria Luisa Morando is another artist represented by photo-eye whose lovely, understated chromogenic prints caught my attention. Morando overexposes her beach scenes for dreamy, minimalistic compositions that delight my senses and also pique my curiosity. At first glance, the prints look like they could be pastel drawings. Despite their physical location (the beach), it’s not hard to imagine that these may also be winter scenes, as each photograph is stripped down to its basic elements – small figure(s) against a wide, vanishing landscape. The viewer is left with a lot of room to impose themselves in these peaceful, zen-like landscapes. For me, her prints evoke a sense of poignant solace. On the right, I certainly feel even a sense of freedom as the swimmer has her arms open to the ocean -- and open to the world, perhaps. I find myself connecting most with the photographs of a single subject. The detail of the sea is lost in her technique, but I don’t find myself missing it – it’s the bright haziness that I love about them. In her photographs, I can imagine myself as a young child having encountered the ocean for what seems to be the first time, and the feeling of being very small in a big, wide world. More work by Maria Luisa Morando can be seen here. If you are interested in learning more about any of the work listed above, please call the Gallery at 505-988-5152 ext. 202 or email me at erin@photoeye.com. *Please note, prices are subject to change.